We want beautiful skin. We want to look younger and live pain-free. What if I told you that there is a way to recapture your youth without surgery, without pills, and without invasive procedures? The key to better-looking skin and faster healing from injuries is simply light. Red light is being studied around the world as a solution for wrinkles, age spots, psoriasis, and wound regeneration. In fact, it was also studied in space by astronauts. Scientists are confirming that red and near infrared light has a positive effect on skin cells. Let’s take a closer look at red light therapy and what it can do for you. Humans and plants have something in common. Our cells respond to light waves. Certain colors of light stimulate our cells to repair and reproduce faster than normal. When skin is exposed to concentrated red and near infrared light, it makes more collagen and elastin. Those are the building blocks of healthy skin. More collagen and elastin means firmer, younger-looking skin. Although lasers were used in early light experiments on skin cell growth, doctors have discovered that LED lights work, too. LED lamps can make cells grow up to two times as fast and blood circulate faster. They are also cheaper to buy and safer to use so you can try out red light therapy at home. Stars such as Jessica Alba swear by red light treatments. They are much gentler than chemical peels, Botox, and lasers. You don’t need to wait days for your skin to recover. What can red light therapy do for you? reversing hair loss from certain conditions. Now doesn’t that list make you want to run right out and try it? Does red light therapy actually make a difference? Yes, it does, according to doctors and patients. It’s not just woo-woo made-up science. Low-level laser (light) therapy (LLLT) is a fast-growing technology used to treat a multitude of conditions that require stimulation of healing, relief of pain and inflammation, and restoration of function… The noninvasive nature and almost complete absence of side effects encourage further testing in dermatology. They tested a variety of LED and laser devices on various conditions ranging from acne to age spots to wrinkles. The results they saw were generally positive. LLLT appears to have a wide range of applications in dermatology, especially in indications where stimulation of healing, reduction of inflammation, reduction of cell death, and skin rejuvenation are required. Although it doesn’t look porous, your skin lets light through. Certain wavelengths reach deeper than others. As you can see in this image below, red and near infrared go deepest. You may have heard of blue light therapy for acne. Blue light kills off the bacteria that causes pimples, but blue light waves don’t penetrate very deep. Red light penetrates down past the epidermis, the top layer of skin, into the dermis underneath. It stimulates fibroblasts, or connective tissues, to develop. That, in turn, makes more collagen and elastin. The process starts right away, but it takes a while for the cumulative results to show. That’s why when you start red light therapy you won’t see wrinkles disappear after the first treatment. You’ll need to continue making visits to the dermatologist or doing sessions at home for a few weeks. Where can you get red light therapy treatments? You can make an appointment with a dermatologist for light therapy if their office is equipped for that. Some tanning salons also offer treatments. Or better yet, you can use one of the home use devices we'll look at below. The cost of purchasing one of these is often less expensive than a series of treatments in an office. Is red light therapy safe? What are the risks and side effects? If you use red light therapy on your face, it’s a good idea to use goggles similar to those used when tanning indoors. At a minimum, don’t look directly into the light. See below for a more explicit warning about what happens if you spend too much time staring at infrared lights. If you are taking medications or supplements that make you sensitive to light, consult with your doctor before you try red light therapy. Some of these include retinoids like Accutane or St. John’s Wort. Red LEDs and cold laser lights don’t get very hot. You can touch them after they’ve been operating for a while and not get burned. Even though, follow the device manufacturer’s directions and don’t exceed the exposure time limits they recommend. More time under the light doesn’t necessarily mean you’ll get better results. In some cases, you could irritate your skin instead of healing it. Now let’s take a look at the wide assortment of red light therapy devices you can use at home. These products are made to be used by adults, both women and men. The following products are all made to be held in your hand. If you prefer hands-free treatments, skip down to the next section. The Baby Quasar MD Plus is one of the best home use devices for making wrinkles and age spots disappear. It has FDA clearance because it is safe and painless to use. The MD Plus uses red, amber, and infrared LEDs for maximum effect. Each treatment takes a little less than 15 minutes. While you are using the MD Plus, you can still use other skin care products like anti-wrinkle serums. Baby Quasar says to imagine that your face is divided into sections. You’ll hold the light against each section for three minutes, then move to the next area. The MD Plus automatically shuts off the light after three minutes in case you forget to time it. It runs on electricity, not batteries, so you’ll need to plug in to do treatments. Baby Quasar includes protective goggles and a travel pouch. The clear protective lens cap serves two purposes—it protects the LEDs and makes it so you can share the MD Plus with another person without spreading any contamination. Baby Quasar says to expect results within 8 weeks if you use it five days a week. Some users have seen a difference in as little as two weeks. After you’ve seen your wrinkles disappear, they recommend doing maintenance treatments twice a week. They have a 90-day money-back guarantee and a lifetime “no questions asked” warranty. If you have questions, they have excellent customer support. Besides the MD Plus, Baby Quasar has other red light LED devices. Check out the portable one below. If you want a smaller portable device so you can do treatments on the road, the Baby Quasar PURE RAYZ is the solution for you. It’s powerful, and just as easy to use as the MD Plus. Baby Quasar says to use the PURE RAYZ five times a week, with three minute treatments on each area of skin. It has a built-in timer so you know when you’re done. For example, place the RAYZ on your crow’s feet near one eye and move it in a slow circular motion. When the timer gives the alert, move the device to the other side of your face. Baby Quasar includes protective goggles in the box. Like the MD Plus, the RAYZ has a money-back guarantee and is covered by their warranty. Yes, it seems like we’re repeating ourselves with all these Baby Quasar products. But we couldn’t ignore the PLUS. It’s been featured in the New York Times, Vogue, and New Beauty. The PLUS is a little smaller than the MD Plus although its design is similar. It’s typically priced between the portable PURE RAYZ and the high end MD Plus, and that’s why we included it here as an option for you. You can use it just like you would the other two Baby Quasar devices. Another big name in the world of LLLT (low level light therapy) is LightStim. This company has been in business since 2002 and has been mentioned in Marie Claire, InStyle, and Redbook magazines. The LightStim for Wrinkles has won the Pure Beauty Award, the Dermascope Aestheticians' Choice Award, and the American Spa Professional's Choice Award. Like Baby Quasar’s MD Plus, the LightStim for Wrinkles uses a variety of red wavelength lights to achieve the best results. It has 72 LEDs divided between Amber, Light Red, Dark Red, and Infrared. Similar to the Baby Quasars, the LightStim needs to be used for three minutes on each section of skin. There’s even an app for that. LightStim offers a free app download for iPhone that helps you time treatments while it gives you tips about skin care. LightStim promises results within 8 weeks, citing a clinical study where 100% of the participants had diminished wrinkles and fine lines after that time. Like the MD Plus, the LightStim for Wrinkles needs to be plugged into a wall outlet to operate. The LightStim for Wrinkles is cleared by the FDA. It has a 90-day money-back guarantee with a 5-year warranty. It comes with a carry pouch and a sample of PhotoSerum that may speed up your skin’s rejuvenation. Norlanya sells a handheld Red Light Therapy Machine with 40 LEDs that emit a 660nm wavelength. With only one wavelength, or light color, it may be less effective than the other home devices we covered above. But Norlanya says to expect an improvement in your skin’s appearance within 4 to 8 weeks. There are two modes—continuous and pulse. We weren’t certain why a person would want intermittent pulses of light and Norlanya doesn’t explains why this might be useful. On the plus side, the Norlanya device has a rechargeable battery so it’s truly portable. If you want to treat your wrinkles on the subway ride home, you can. The Tanda Luxe is considerably cheaper than the Baby Quasar MD Plus. It’s also FDA-approved in the USA and cleared by the national health service in Canada. Another bonus is that it’s rechargeable and cordless, so it’s very portable, unlike the MD Plus. The Tanda Luxe uses an assortment of 660nm LEDs to rejuvenate your skin. The directions recommend using it twice a week for best results. Tanda says the Luxe won’t turn on unless it’s in direct contact with skin. Like the MD Plus, it’s small and you’ll have to move it around your face in sections. Do one part until the Luxe turns off automatically after three minutes. Then move to the next area. The Luxe is FDA-cleared and also Health Canada approved. It comes with a recharging stand, power supply, and goggles. Not everyone wants to sit for up to fifteen minutes with a LED lamp in their hand. You can also treat your skin without having to hold anything at all. Lay down and enjoy your skin rejuvenation treatments with the Trophy Skin Rejuvalite. It doesn’t require direct contact with your skin. Place it no more than 6 inches away from your face or other body part and just relax. Be sure and use those goggles! Trophy Skin recommends one or two 5-minute treatments each day for five days each week. They say that the more it’s used the faster you’ll see results. The Rejuvalite features red, yellow, amber, and infrared LEDs for extra power. The Rejuvalite needs electricity to operate, but it accepts anything from 100-240V, so you can take it traveling overseas with you, just bring a plug adapter. It comes with a 30-day money-back guarantee and a 1-year warranty. When you think of a facial mask for beauty purposes, you probably don’t imagine this one. But Angel Kiss promises fast results with their LED mask. They say you’ll see a difference in only 3 to 5 weeks. That may be because it incorporates red, blue, and green light and it covers your whole face at once. You can’t miss a spot when you’re wearing this. The mask needs electricity to operate. It comes with a power adapter and a controller to turn it off and on and change the colors. It’s possible to adjust the fit a little bit with the included strap, but it’s a one-size-fits-most deal. While you do treatments with light devices, you can also use serums and creams to speed up the process. The Miravage Facial Relief Cream is packed full of ingredients that moisturize and pamper your skin. You can use it twice a day under makeup and before bed. This serum is said to reduce redness and inflammation from rosacea and acne. It shrinks pores, restores elasticity, and plumps up dry skin to make it look young again. It leaves your face feeling soft and refreshed. Many of the red light device manufacturers recommend cleansing your skin before treatments, then moisturizing afterward. The Miravage serum is the perfect accompaniment. Red light helps heal wounds and relieve chronic pain. Here are the top devices for treating yourself at home. TENDLITE is FDA-approved for pain relief and anti-inflammation therapy. It’s an American invention manufactured in the USA, but it’s been used around the world by athletes and ordinary folks who are tired of suffering and tired of taking pills. It helps heal and reduce the pain of Carpal Tunnel Syndrome, arthritis, bursitis, tendonitis, Plantar Fasciitis, sciatica, and fibromyalgia. It’s non-addictive and has no unpleasant side effects. How do you use the TENDLITE? Hold it ½-inch above your sore spot and let it shine down between one to three minutes. You can repeat the treatment up to three times a day. It has a rechargeable battery so you can use it anywhere. You have 60 days to try out the TENDLITE. If you’re not happy with results, return it for a full refund. It comes with a 1-year warranty on the device and a lifetime warranty on the LEDs. Like the TENDLITE, the LightStim for Pain relieves arthritis, swelling, bruising, and other aches and pains. It has a mix of red and infrared LEDs for maximum power. The LEDs provide a gentle heat when you shine the LightStim on the affected part of your body. The red light increases your blood circulation and makes cells grow faster. This speeds up your healing, relaxes your muscles, and shrinks inflammation so you feel better. Unlike the TENDLITE, you can use the LightStim for up to 30 minutes at a time. The DPL FlexPad works for up to 14 minutes on each painful area of your body. You don’t have to hold it in position because it comes with Velcro straps to secure it in place. The 9-3/4-inch long by 5-inch wide flexible pad is embedded with rows of red LEDs that provide a gentle heat while they shrink inflamed tissues, relax muscles, and help painful joints feel better. The only downside is that you’ll need to stay near an electrical outlet while you do the treatment. But if you’re in pain, it’s nice to take a rest anyway. Certain kinds of hair loss in both men and women can be prevented and reversed with red light therapy. These devices increase circulation in your scalp and help revive follicles. 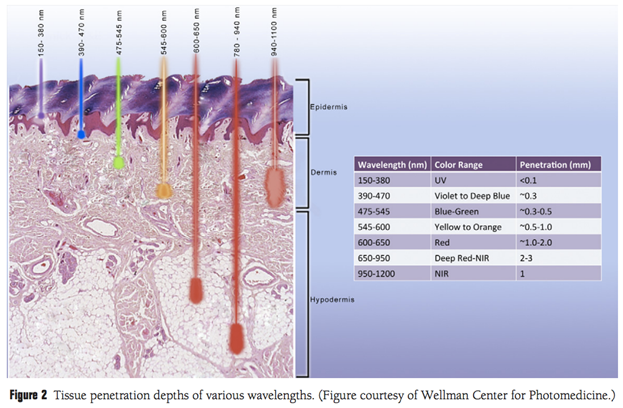 The red end of the light spectrum between 630 to 670 nanometers puts follicles into their growth stage, or anagen phase. While they may not be as effective as treatments like Rogaine, they also have no negative side effects. The conditions that are most susceptible to improvement with red light therapy is hair loss from chemotherapy and alopecia arreata. Yes, this qualifies as a hands-free device. iRestore says that their laser hair growth system is also FDA-cleared as a medical device to treat hair loss. Don’t laugh too loud, people are getting good results with this. The helmet uses red light in the wavelength of 650 nanometers emitted by 51 medical-grade lasers and LED lights embedded around the inside. iRestore says that wearing the device for 25-minute sessions, three times a week, will increase hair growth within 12 to 24 weeks. You can use other hair loss treatments, like Rogaine, at the same time. If you don’t see the results you hoped for, iRestore offers a 6-month money-back guarantee and a 1-year warranty. Remember when we mentioned that astronauts experimented with red light therapy? Theradome’s founder is a former NASA scientist who wanted to stop his own hair loss. The Hair Growth Helmet has FDA approval and it works for both men and women. Up to 97% of users find it effective to some degree. Multiple members of the family can use the same device. The helmet is hands-free and can be adjusted to fit properly with the use of the foam pads included in the box. This helmet uses 678nm cold laser light from 80 individual lasers to reach hair follicles more effectively than LED light can. It’s rechargeable so it’s cordless. You can wear it while you do other things. The manufacturer recommends two 20-minute sessions a week. We appreciate the fact that iGrow makes hair re-growth less boring with the built-in headphones. After all, if you have to spend a few minutes every day with this on your head, why not listen to music or an audiobook? The nice part is that you don’t have to do anything besides sit there and let it work. The iGrow hair regrowth system uses both LED and cold laser light to stimulate your scalp. It doesn’t hurt or have side effects as long as you use it as directed. They recommend sticking with the treatments for 4 to 6 months to see results. It comes with a 1-year warranty. The HairMax LaserComb won an award from NewBeauty for “Best At-Home Anti-Hair Loss Device” in 2014. It’s simple to use but quite effective nonetheless. HairMax says that more than 90% of their users saw results by the 5th month of using the LaserComb. Their own clinical studies found that the average person saw a 15% increase in hair density. All you have to do is slowly glide it over your scalp for 8 minutes a day, three days a week. Its 12 laser beams wake up your hair follicles and put them into the growth phase. The small LCD display on the back shows you the elapsed treatment time and the status of the lithium-ion rechargeable battery. It comes with a charging base, travel case, and full instructions. Red light LEDs were used by astronauts in space as grow lights for plants in the 1990s. The LEDS were ten times brighter than the sun so they sped up plant cell metabolism and photosynthesis. Later on, someone got the bright idea to try using red LED light on human skin. This turned out to be a very good idea. Wounds normally heal slowly in space, but red spectrum light helped resolve this problem. They discovered that red light helps human skin and hair cells grow faster. This led to testing red light as a treatment for acne, rosacea, psoriasis, age spots, wrinkles, and even cancer. Experiments continue today as scientists look at what mix of light and what dosages get the best results. Infrared light is the invisible part of the red spectrum. It’s what most TV remotes use to communicate with televisions. Infrared bulbs are often seen in reptile aquariums and chick hatcheries because they put out heat. People have caught on to infrared light as a healing therapy. Please note that you will definitely want to use protective goggles if you try infrared as a treatment in your home. The RubyLux NIR-A Near Infrared Bulb is a powerful light and heat source. It puts out 250 watts of 850nm wavelength light. This is still visible to the human eye so it’s considered NIR, or near infrared. This bulb fits ordinary light sockets. You’ll only need to check that the socket or lamp is made to handle a bulb that needs 250 watts. Why would you want infrared light bulbs in your home? Well, besides growing plants, you can use the warmth of these lights in a sauna or heat up your bathroom with them. Light in this range of the spectrum can penetrate deep into your skin, increasing your blood circulation and reducing inflammation. We highly recommend using protective eyewear when you do red light therapy. These goggles from RubyLux are made to keep you safe from infrared and ultraviolet rays. They have an elastic band to ensure an appropriate fit. Red light therapy devices sometimes include infrared bulbs or LEDs. It’s best if you never stare at these lights. While your skin can feel the heat from infrared, your eyes can’t detect infrared wavelengths. Stare too long at an infrared bulb that’s lit and you could literally burn your retinas. Repeated exposure can cause you to develop cataracts and corneal ulcers. Avoid problems down the road and wear eye protection when you do red light therapy treatments on your face. With such a wide variety of products, how do you choose the best ones for you? Let’s consider your needs. Do you need a portable device, or are you able to do treatments near an electrical outlet? Some people buy one of each, both battery and electrical, so they have one device for use at home and one for travel. Of course, budget is often a factor in our decisions. But our advice is to buy the best product you can afford. You deserve it. Better products mean getting results sooner. Most of the devices in this review have a money-back satisfaction guarantee as well, so your risk is a lot lower. We hope you find the perfect red light therapy device for your needs. Check back soon for reviews of the best in personal care products. In the meantime, although we believe in the power of red light therapy, we urge you to follow your doctor’s instructions for the treatment of any condition you may be suffering. If he or she is unaware of this new and exciting therapy, invite your doctor to investigate it further with you.